I have caught a new virus. Apparently it has lain dormant in my system for many years and has only recently been activated, apparently by exposure to others who also carry the virus. The symptoms have been showing up slowly ... a purple and pistachio painted bench here, mosaicked "flowers" showing up among the pavers there but today the reality of the virus erupted like measles when I carried home from an estate sale ... not the set of new dishes (which were lovely and I actually need) or any of the useful kitchen or garden tools, or even anything from the rack of winter sweaters available for $10 each. No ... what actually wound up in my car were twelve concrete balcony posts, a three-foot length of irrigation pipe, two concrete pieces of unknown use and origin and a metal "thingy" that who knows what it's original purpose was. And, what do these things have in common? 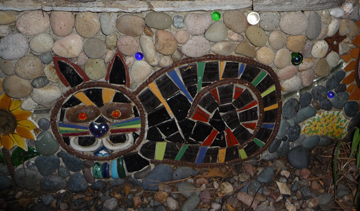 They are potential mosaic surfaces and triggered a vision of an art possibility for my yard. Everything I look at seems to transform itself into a riot of colorful broken plates and glass ... at least in my mind. What I seem to have come down with is known as vernacular artist-environment builder virus. Vernacular means untrained and the rest means people who get way carried away with arting up their living spaces. It seems to happen more to mosaic artists and sculptors but can also be seen in toll painters and stained glass artists. Lately I've been introduced to some artists who have created art wonderlands around themselves. They are mostly mad, magical, incredible spaces that have left me boggled, overwhelmed and deeply infected. I don't know how far this virus will take me ... fortunately it usually takes 25-30 years before things get completely crazy and out of hand so I may run out of energy before it reaches that point. Or maybe there's a vaccine that will let me stop after just a light sprinkling of yard art here and there. Who knows? About the image: Detail of one wall of this artist-environment builder's yard. How can you not be infected by this? I'm so glad there's no innoculation for this virus. I'm glad you're infected and are infecting me! and... I hope it takes you where ever it wants to go! It definitely has places to go, things to create and wonder to instill! I had an item about those artist environment-builder types in last week's Facts column. The Original Rhinestone Cowboy had the same virus. Maureen ... your post about the Rhinestone Cowboy was part of the stimulus for this post. I'm starting to collect these examples of the virus. A friend of mine did a dissertation on creative flooding ... that may be another name for the virus. Ohmigosh, what fun! Can't WAIT to see what emerges from this one!